I guess it depends on what you mean by 'the exact same thing'. I look at that line of blue jackets and see (a) copies with the Allen & Unwin spine imprint, (b) a copy of the Book Club Associates edition with its BCA device on the spine, and (c) a copy of the thin Taiwan edition at far right; and at the same time, I suppose that most, maybe all, of the A&U copies represent variants - domestic and export, cloth or paper over boards, etc. Christina and I have about as many of these ourselves, and many more of the first American edition, where there's even more variation of printing and binding. 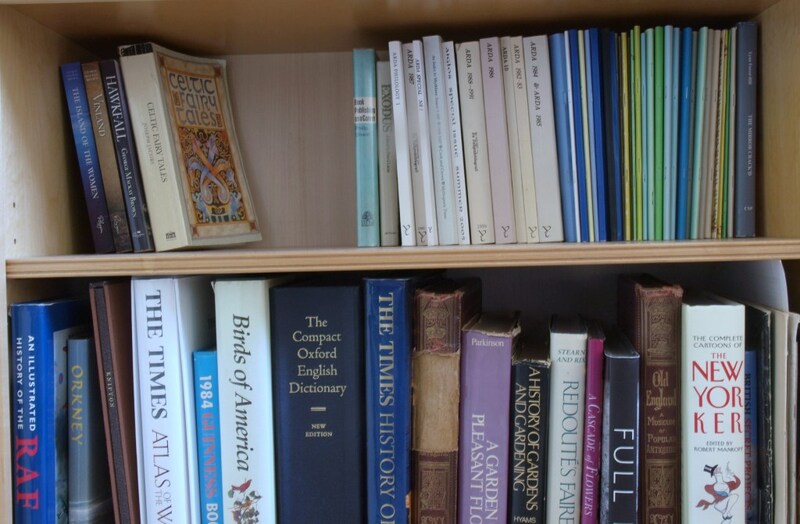 Ours is a 'bibliographical' collection, which naturally isn't for everyone and does indeed take up shelf space. Well, when I said I had more copies, I meant overall; I don't have ten A&U ists. Nasmith de luxe signed CT and Ted. Two more Nasmiths, both signed as they were published. Methuen full leather, with bookplate signed by CT.
My half dozen or so Allen and Unwin 1sts include variants of printer (Jarrold, Clowes, and Unwin Bros) and also of cover material, and the colour of the top edge stain. I don't think of any of my books as a waste of space, and I'm not a dealer. Why have so many? I can't even claim Wayn'e (perfectly legit.) excuse - I'm not a bibliographer. But an interest in Tolkien bibliography is one of the mainstays of my interest in Tolkien in general, so these things (ie books) just sort of sneaked up on me. Just to support what garm says, I too have half a dozen A&U 1sts with variations. I do worry about the shelf space issue but, as with garm, it is part of my interest in Tolkien and it did kind of sneak up on me (and most have only cost a pound or two - literally). * one with a label saying "Final Setting"
* signed by Guy Gavriel Kay. I was just trying to find out about all The Silmarillion copies and this has turned in to quite an interesting thread. Thanks everyone for the comments. Looking over my bookcases, I guess I'm pretty much the same as the rest of you with my duplicate and multiple copies of various books (though I only own a few copies of The Silmarillion). 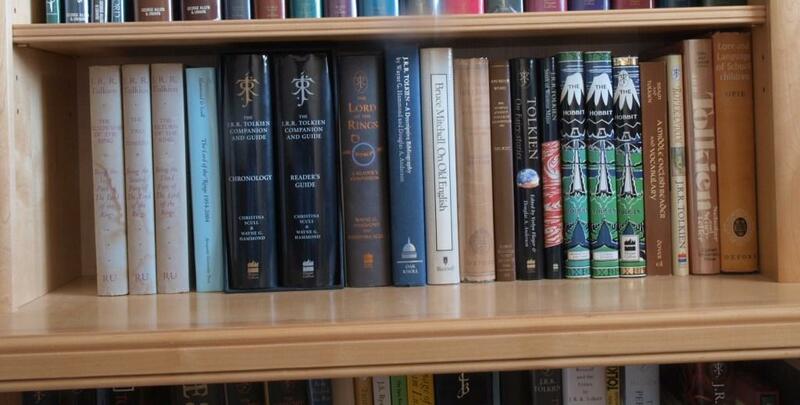 I do have 4 sets of the Tolkien Companion and Guide, which is rather peculiar. Don't get me wrong; the 2 volume set is indispensable, but do I really need 4 sets? I think I had planned to sell some of these on eBay at some point but never got around to it. I guess that is the case with a number of extra copies I have lying about. I'm no Wayne or Christina, & don't claim to be; but my own collecting of The Silmarillion is almost exclusively bibliographical. I'm very interested in its printing, publication, and dissemination 'story' (although I almost exclusively derive this information, with all its pitfalls, from the books themselves; unlike W&C who have examined archives etc); as a result I've bought many, many copies of the 1977 edition. Although I have one or two 'upgrades' (two I think), none of the rest are 'the same'. Some are bibliographical variants; some are the same (bibliographically), but have some contemporary marginalia, or are signed copies. So, as others have pointed out, a standard Billing UK 1rst isn't really the same as a standard Billing UK 1st signed by CT; I think everyone would view these as two distinct collectable copies. Numbers? As I've probably mentioned many times on this forum, I don't even have all the nice 'special' editions any 'Silmarillion Collector' would want: Dummy copies, Methuen, 1982 Super Deluxe, 1998 Super Deluxe, Folio Deluxe etc --I have none of these. But, & this includes two or three foreign editions, a few US editions, and probably a few dozen pb's --I have about 90+. And, yes, they do take up quite a bit of room. Khamul, I would love to see photos of your collection sometime. I also need to add in two more to my list: first and second illustrated hardbacks by Ted Nasmith. Peculiar? No, no, everyone should have (at least) four sets of the Companion and Guide. Scatter them around the house, so that one is always close at hand for easy reference. We could recommend some other books too, coincidentally by the same authors, that should be bought in multiple copies. I'm very interested in its printing, publication, and dissemination 'story' (although I almost exclusively derive this information, with all its pitfalls, from the books themselves; unlike W&C who have examined archives etc); as a result I've bought many, many copies of the 1977 edition. Archives are important, but what you're doing is good, solid 'real world' research, and to be applauded. In regard to the 'Hawaii knock-off', is that not a Taiwanese pirate? Our copy appears to be. For 'Ballantine' you mean 'Houghton Mifflin', as you have a hardcover, though Ballantine did have similar covers for their earliest paperback printings. We're curious to know what the 'Final Setting' label means in that A&U copy, if you know. And to be fair to the publisher of the Taiwanese edition at the end of the shelf - assuming that it's the same edition that we have, and not another variant - it's not a knock-off, since Allen & Unwin gave permission.